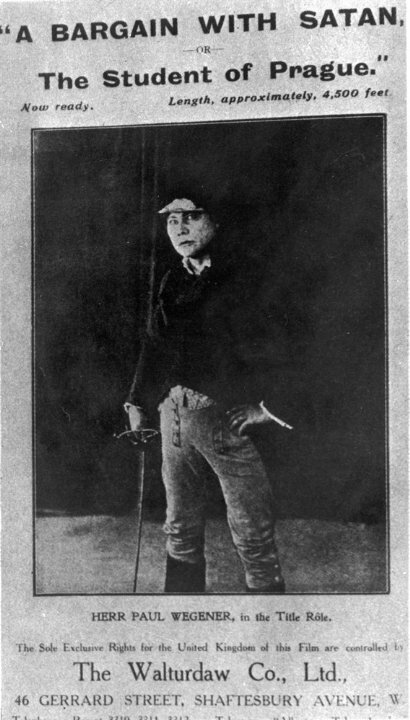 1913’s The Student of Prague is cinema history’s first feature length horror film, and some historians have argued it to be the first feature length film, in general. 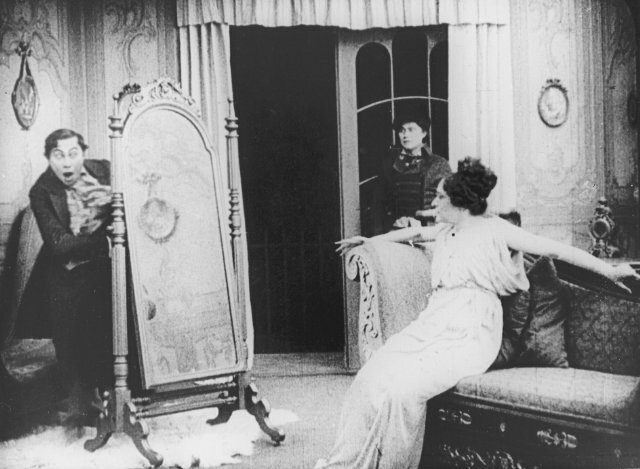 Earlier filmmakers certainly played with elements of the macabre, most notably George Méliès who incorporated Gothic tropes as early as 1896, but their intentions were almost always to titillate their audience rather than disturb them. Some early short films, particularly by D.W. Griffith, or 1910’s Frankenstein, played with dark elements and could easily qualify today as horror. 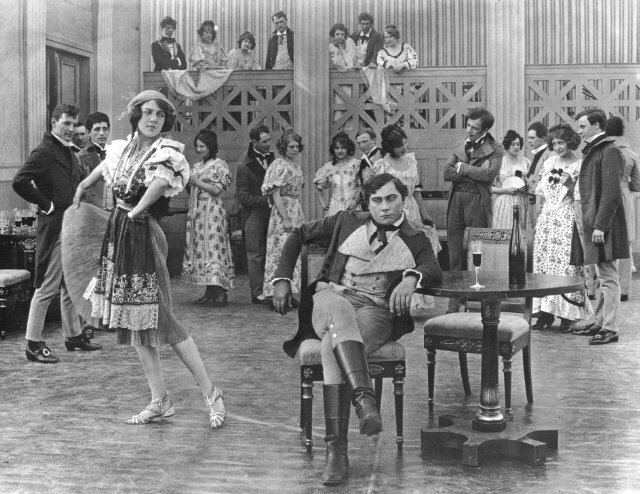 It was the pre-war The Student of Prague, however, that helped to launch the German Expressionist movement and first employed camera effects to create ghostly images meant to shock and frighten with a longer running time, attempting to create more complex characters than the short film model allowed. Drawing inspiration from E.T.A. Hoffmann’s “A New Year’s Eve Adventure” (1814) and Edgar Allan Poe’s “William Wilson” (1839), with a bit of the Faustian mythos added, the original script, written by novelist Hanns Heinz Ewers, revolves around a student and accomplished fencer named Balduin. The cash-strapped student agrees to exchange anything in his mostly barren boarding room to a mysterious man named Scapinelli in return for a magical change-purse which produces endless amounts of gold coins. Scapinelli, to the student’s and contemporary audience’s horror, chooses the student’s reflection, which leaves the mirror and becomes a haunting, murderous doppelganger bent on ruining the student’s life. The Student of Prague is an intriguing film which uses camera effects that are impressive for the time. The scenes in which Balduin, played by Paul Wegener, is interacting with himself through use of split screen look great, actually better than most other films I’ve seen that attempt this same illusion. His character, though, is the only one that fully succeeds in getting fleshed out. Unlike the source materials which inspired the story, or the popular contemporary interpretations of Dr. Jekyll and Mr. Hyde, Balduin’s double does not represent an unsavory element of his personality. The real horror of the tale is that Balduin’s decency means that he is wholly undeserving of the malicious machinations which haunt him. It is a cautionary tale, but not necessarily a moralizing one. Shot on location in Prague, though the film influenced post-war German Expressionism it is distinct from it in important ways. Notably, the realism of the locations is emphasized – the supernatural is seen to be imposing on a believable reality. This is typical of a story inspired by Hoffmann, whose writing attempted to produce the same effect. This devotion to realism, however, effects the film’s pacing, which can be languorous, lingering too long on location shots. About halfway through watching I sped the film up to 1.5 speed, improving its pacing considerably for this modern viewer’s sensibilities. Other films had already begun to effectively employ close-ups, but the stationary camerawork and wide angles used here sometimes leave you squinting to see just who is on the screen and what they’re doing. Overall, aside from the doppelganger effects, the direction takes a great deal from the stage, perhaps too much, as it’s still early in German filmmaking whereas American filmmakers like Griffith had already begun to master and evolve the film medium to a considerable degree. The film was remade in 1926 by many of the people involved in both The Cabinet of Dr. Caligari (1920) and Nosferatu (1922), but the present state of that film, which is superior in many ways, makes it less watchable than this earlier version. It is worth pausing and taking note of the men involved in making this film, and what they say about early German cinema and what was to become of it. The screenwriter was Hanns Heinz Ewers, a famed German horror writer who is virtually unknown today due to his eventual ties with the Nazi Party, although his criticism of the party’s anti-Semitism and his own homosexual leanings lost him favor with the National Socialists. Nevertheless, he was among the first to take screenwriting as seriously as literary writing. The director, Stellan Rye, would die the following year at the outbreak of the war as a POW in France. The film’s star, Paul Wegener, would go on to make horror history by creating the Golem trilogy (1915, 1917, and 1920), only the last of which survives, which propelled the monster subgenre and served as a major influence upon James Whale’s Frankenstein (1931), which was also influenced by 1926’s The Magician, which also starred Wegener. He was horror cinema’s first real star and was among the earliest to take the film medium seriously, seeing it as distinct from and not dependent upon either literature or drama. He would appear in some Nazi propaganda films while secretly financing resistance movements and harboring fugitives from the Nazis. After the war he would help to rebuild Germany’s art scene until his death a few years later. And finally, the tragic John Gottowt, who played Scapinelli, and who was Jewish, would be banned from German entertainment by the Nazis and eventually murdered by the SS in Poland in 1942. The Student of Prague will be of interest to those dedicated to seriously exploring the roots of film horror, like myself, but offers little to those not so predisposed. It doesn’t have the strengths of the silent horrors of the 1920s, and while it’s a great effort, it does show its age. Regardless, the scenes of Balduin facing his doppelganger are still impressive and will stick with the viewer long after the film is over.